with a washable, non-toxic natural finish called “AFM Naturals Oil Wax Finish” by Safecoat. 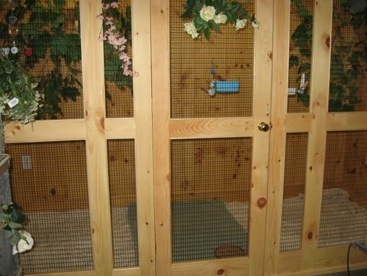 Wire panels were custom cut and powder coated by KW Cages. The largest aviary measures 18 feet long, 5 feet wide and 8 feet high. 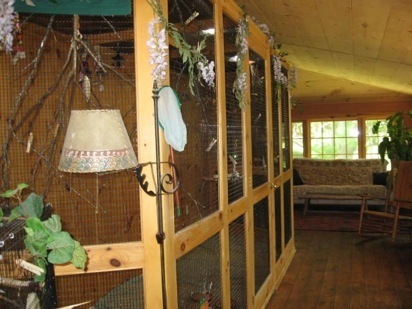 The smallest aviary is 4 feet wide, 2.5 feet wide and 5 feet high. 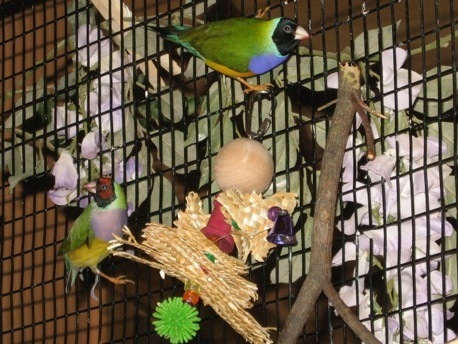 I use these aviaries to house all of my non-breeding Gouldians. 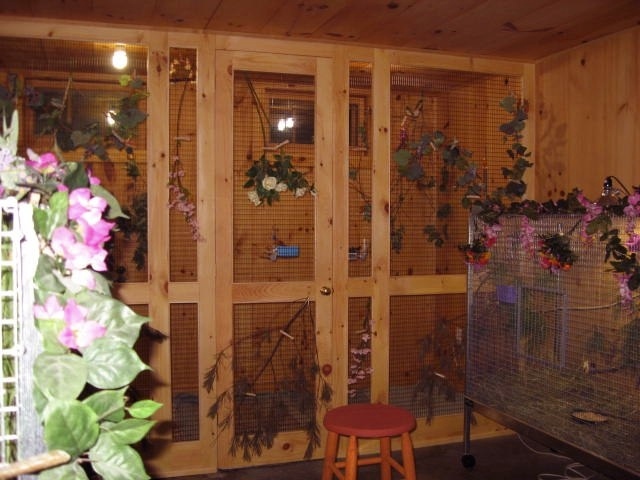 For single breeding pairs, as well as for birds in quarantine, I use custom-designed KW cages measuring 3 feet long, 2 feet wide and 20 inches high. In my experience, this cage size is the minimum that will prevent breeding pairs from losing condition during the breeding season, and which will also allow babies to develop strong flight skills (see “Breeding” section). To minimize clean-up, I place inexpensive bath towels across the floor of each aviary and run each towel through the washing machine as needed. In the breeding cages, I use clean, grassy hay as bedding. 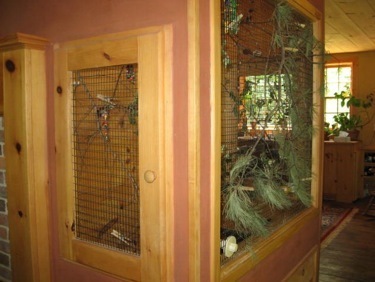 For perches, I gather maple, willow, apple and white pine boughs, and attach them to the ceiling or side wire. I have found that the addition of small-bird toys makes an enormous difference in the daily enjoyment and activity level of my Gouldian flock: they prefer toys which can be ripped or shredded (well, at least they try). Swings are also extremely popular. I always place dry seed bowls on the floor, and offer water, greens, softfood and supplements higher up. This encourages the birds to eat more of the highly nutritious foods and forces them to expend energy to reach the more popular dry seed. When new birds are introduced to one of the aviaries for the first time, I provide bundles of spray millet tied at a high level in case the new birds are timid about landing on the floor. After a few days I will place the spray millet on the floor near the dry seed bowls and the new birds usually follow the millet and begin to eat from the bowls. For each aviary and breeding cage, I clip one or more compact Vita-lite bulbs to the ceiling inside a brooder lamp. I have heard that full-spectrum lighting will only enable birds to produce and metabolize vitamin D if it is within 24 inches of the birds, so I place perches within two feet of the bulbs whenever possible.